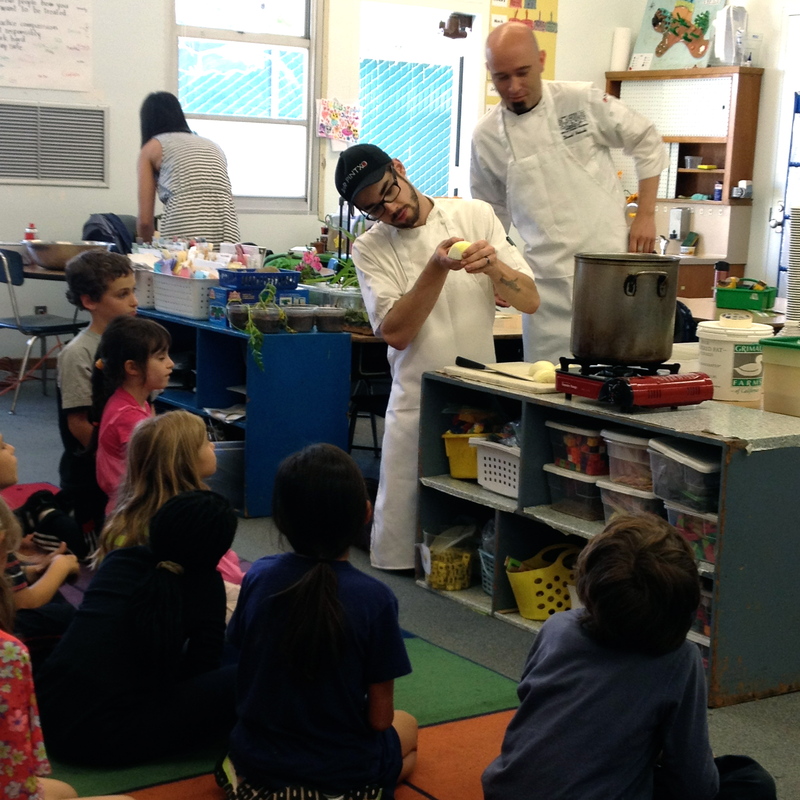 Yesterday I tagged along with Brad while he and David, the executive chef at Bar Pintxo, cooked for a classroom full of 1st and 2nd graders. If you know Brad and I at all, you know that we aren’t really children people. 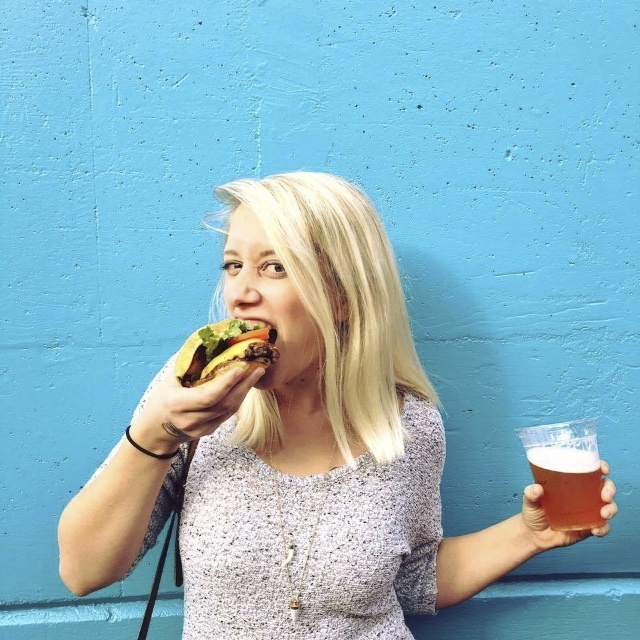 We aren’t sure we ever want children and we don’t have much daily interaction with anyone under the age of 18. It’s not that we don’t like children, I think it’s just that we aren’t sure how exactly to act around them. Those little minds are forever being molded – what if I say something or do something that screws them up forever?! I can sing in front of hundreds of people. On national television. I may get a few butterflies then, but children are a whole different story. I get super nervous when it comes to kiddos. But when I had the opportunity to see Brad thrown in front of 25 inquisitive, hungry and excited six to eight year olds, I gladly packed up my camera and jumped in the back seat. The boys were making chicken noodle soup and cinnamon sugar popcorn for the kids. Nutritious, delicious, and a little dessert to top it all off. I’d just sit in the background and take a few pictures. The guys got this opportunity because our friend, Henrietta, teaches a mixed 1st & 2nd grade class at Westwood Charter Elementary School. I’ve heard it called a “hippie school” because it’s a little non-traditional and the kids get to do some pretty awesome things not typical to public Elementary schools. 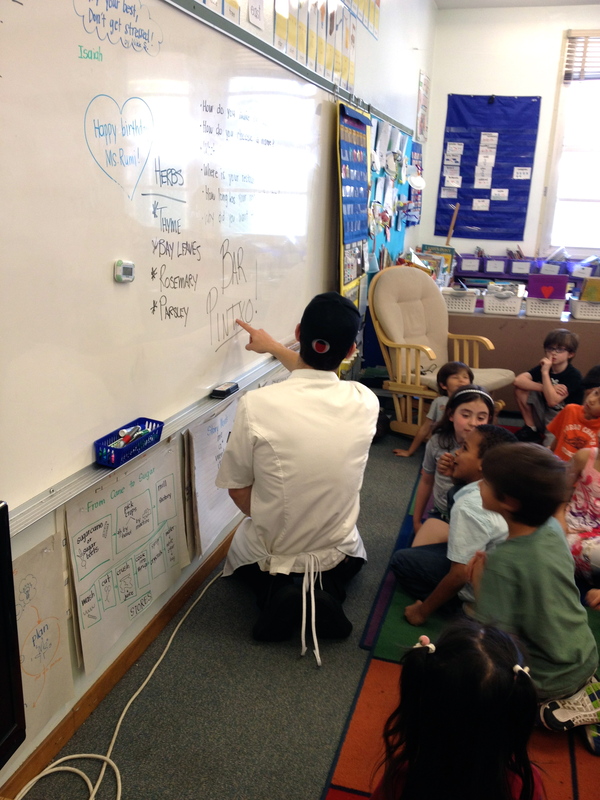 In her class, the kids create a restaurant at the end of every school year. They do everything from applying for a specific job in the restaurant to creating the menu and cooking some food. 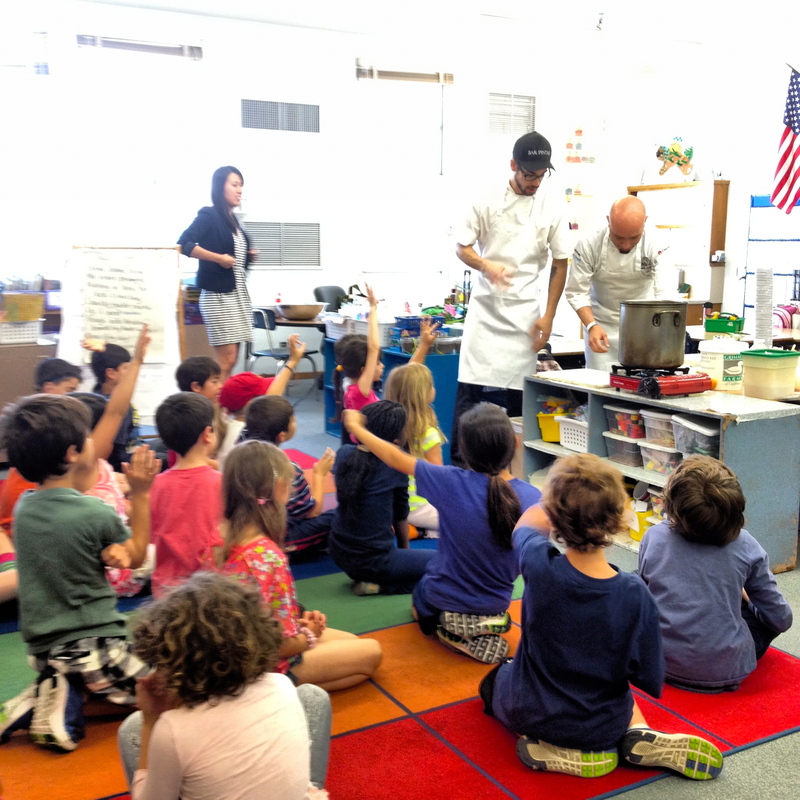 The class has grown vegetables, learned about nutrition, visited local restaurants, and taken a field trip to our Santa Monica Farmer’s Market to discover all the local produce out there. As one of the final steps before the big restaurant project, Henrietta had asked the guys to come in, cook something with or for them, and answer all of the kids’ burning questions about becoming and being a chef. Elementary School has gotten WAY cooler since 1995 when I graduated from Thunder Hill Elementary. 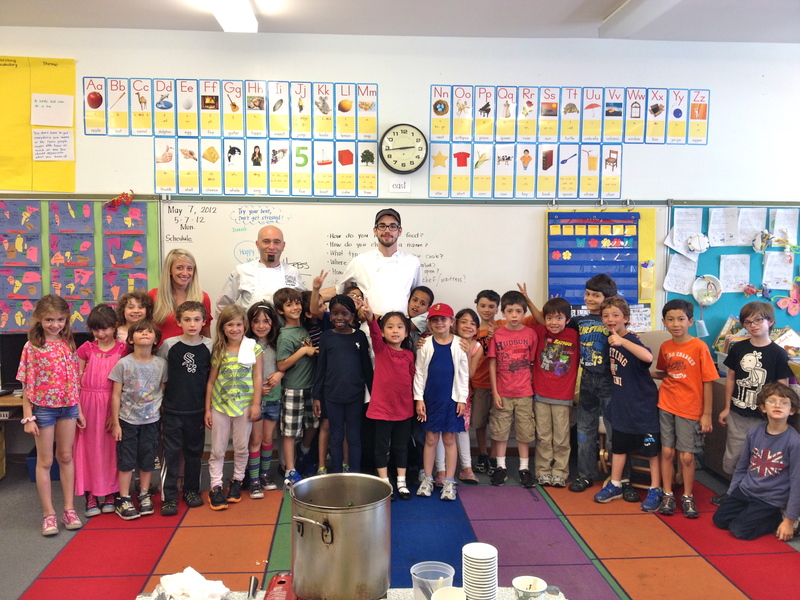 The guys did an awesome job of cooking a simple and delicious meal, letting a few lucky kids add an ingredient or two. 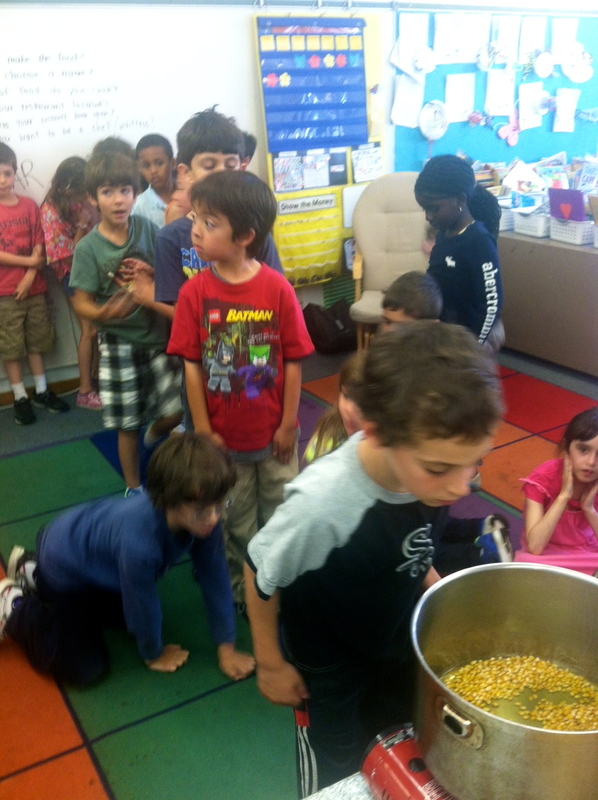 I love this shot Brad took of them checking out the popcorn kernels in oil. They passed around all the herbs for the soup and let everyone smell them. Brad taught them how to efficiently cut an onion. They all learned how to say Bar Pintxo. They each got to stir the soup a few times. 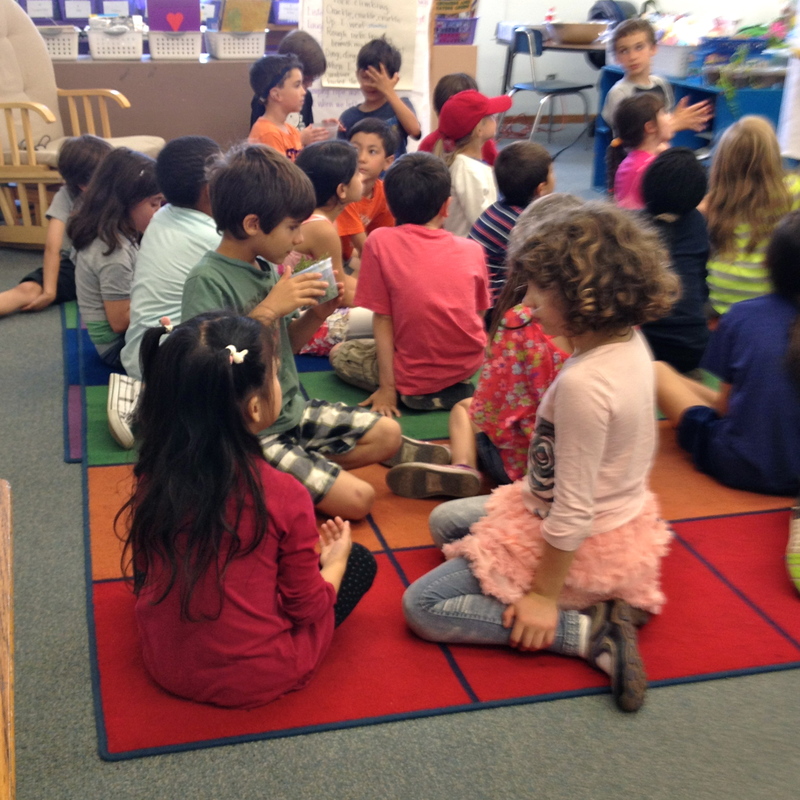 They asked a lot of questions and raved about how good everything smelled. The guys gave a really fun lesson. They also made a pretty darn good soup AND delicious cinnamon sugar popcorn in 40 minutes on a tiny burner. I’d say it was impressive. I kind of felt like I was watching a segment on a late night television show with all of the craziness, improvising, and asides going on, but the kids were great and everyone had a lot of fun. 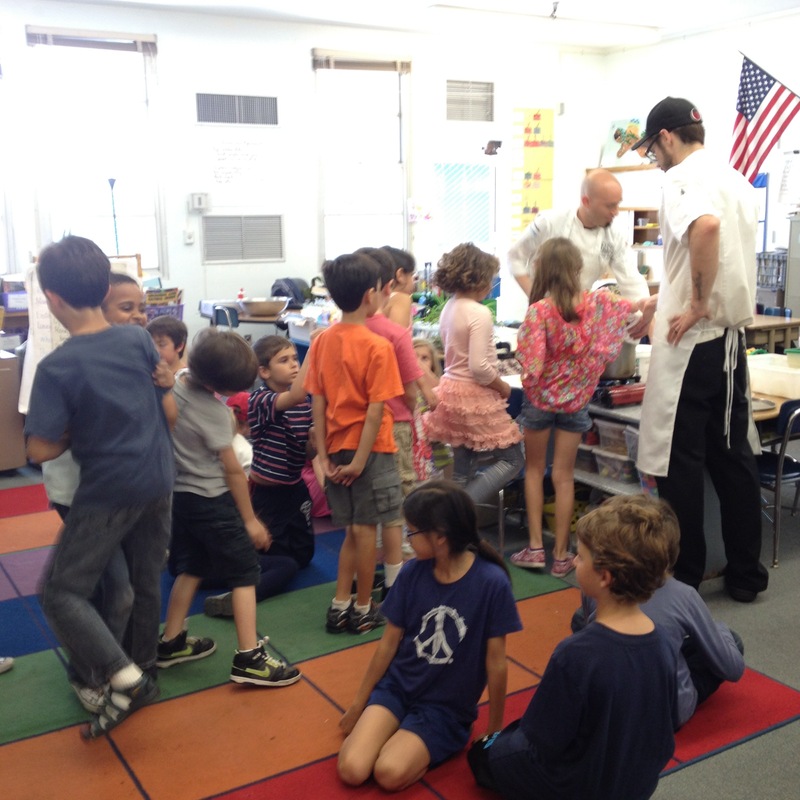 It was really incredible to see children so excited and interested in healthy, good foods. It took me until college to really start to appreciate food and good quality ingredients, but these guys could identify parsley and thyme at first glance and wouldn’t let us serve dessert until we had all had our meal first. I tried my best to hide in the back and just take pictures, but I made a few fans myself. And I’m not going to turn away six year olds wearing tutus that tell me I’m pretty. I’ll take it. And, yes, I’ll stand next to you in the pictures, too. I imagine that the guys are going to be doing many more demonstrations for people of all ages in the years to come. They are both so much fun to watch and listen to talk about food that I hope to be there documenting each and every one. 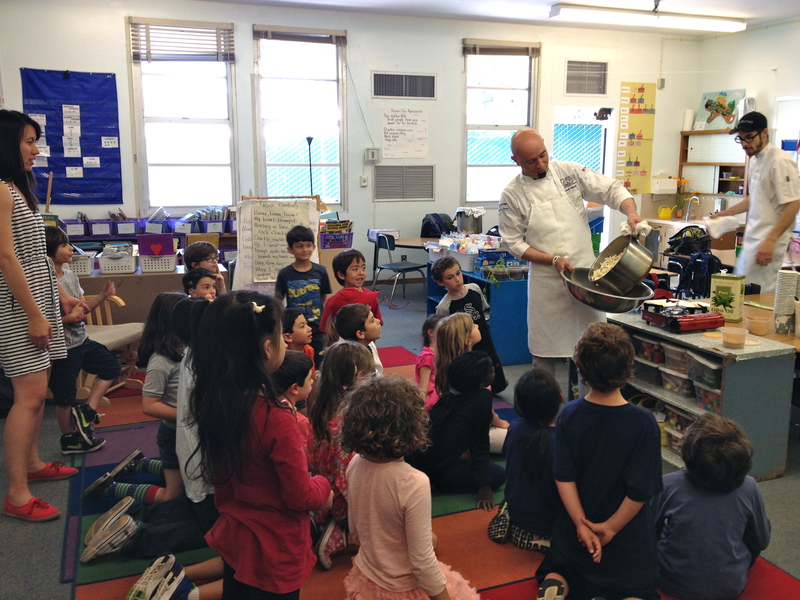 Kindergarden classes to Aspen Food&Wine Festivals. I’m there. Especially when they really are on Late Night with Jimmy Fallon. I better have front row seats. And I better get to shake ?uestLove’s hand. Seriously.